1966 was the second year for the Mustang GT. The GT package was very popular in 1966 because the option sold for $152.20 and included either the 225hp 289ci or the 271hp hi-performance 289ci V8 engine; dual exhaust; fog lamps; special ornamentation; disc brakes; GT racing stripes; and handling package components. Chrome rocker trim and chrome rear quarter ornaments were deleted. Red 1966 Mustang GT hardtop owned by Juan Lemus from La Puente, California. This was our featured Attitude Of The Week photo for the week starting 12-14-08. This GT has a hood scoop and a red/white two-tone Pony interior. This 1966 Mustang convertible was special ordered with Sapphire Blue paint. This paint was not a standard color for the mustang but it was for the 1966 Shelby. This car also has the GT equipment group option. This Candy Apple Red 1966 Mustang GT fastback is owned by Mike S. of Columbia Station, Ohio. This was our featured Attitude Of The Week photo for the week starting July 12, 2009. Mike says, "I got it in 2001. I added a K&N air filter. It has a vintage correct Shelby intake with dual quad set up (Carter's). It looks and sounds great!" 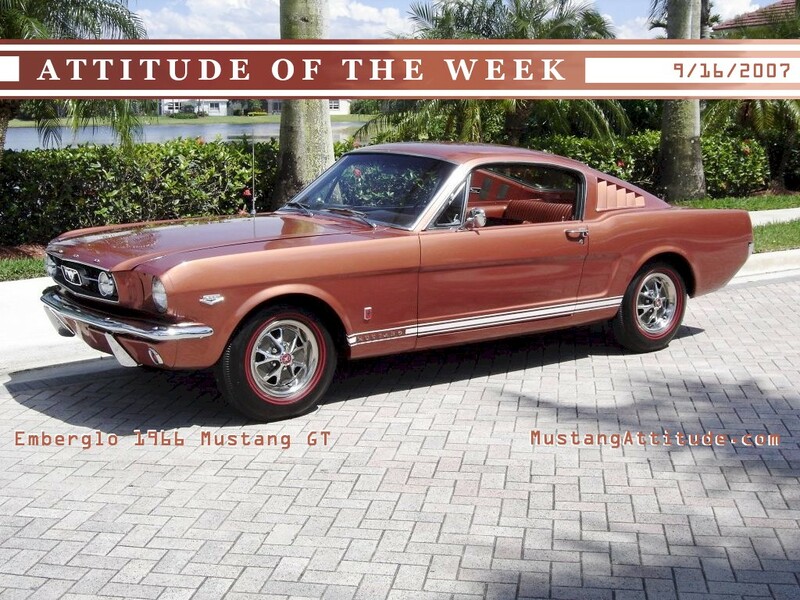 This Emberglo 1966 Mustang GT fastback with K-code engine was the Attitude Of The Week for 9/16/2007. The GT package was very popular in 1966 because the option sold for $152.20 and included the high-performance 271hp (at 6000rpm), 289 cubic inch, V8 engine; dual exhaust; fog lamps; special ornamentation; disc brakes; GT racing stripes and handling package components. This Mustang shows off its Red Band nylon tires which was a option for $48.89, and styled steel wheels for $93.84. This photo is available in two wallpaper sizes; 800-600 wallpaper and 1024-768 wallpaper. Springtime Yellow 1966 Mustang GT hardtop with a black vinyl top and white interior. It has the optional A-code 289ci 4V V8 engine, air conditioning; power steering; Pony interior, and the GT optional wood wheel. Check out this Sauterne Gold 1966 Mustang GT fastback. The owner of CloudCasters owns it. It was our featured Attitude Of The Week for the week starting January 2nd, 2011. The owner comments, "It had been sitting for 4+ years on four flats with an unmolested deluxe interior and exterior. It had a 450 HP dual carbed 302 with a Tremec 6-speed and Total Control Products (TCP) for coil-overs. I got it home, changed all fluids, and added a set of Vari-Shock dual adjustable shocks. A new battery was needed, so a Gel cell red top was added. It was already relocated to the trunk. After a few cranks it fired right up. I ran it down to the muffler shop and purchased 2-1/4-inch pipe with Flow Masters. I drove vehicle for three years until a complete (down to frame) restoration was done. The tear down revealed a dead mice nest in headliner and others in the rear wheel wells. I thought there was an odd smell. The color is Sauterne and is as close as one can get, with modern paints, to the original with the Wimbledon White stripes. The wheels are original style and size. Two sets were purchased and used to make one set that is wider and offset. The semi-slick Toyo R888 are perfectly sized at 235/50/15 in the rear and 205/50/15 up front. All four corners have disk brakes, SSBC up front and the large stock ones that came on the 9-inch Lincoln Versi rear end. The differential is a built with 3.80 gears, connected using an aluminum drive shaft. The steering is done with Flaming River components and a sub-frame kit welded underneath. This car is solid, and has been done very very well." Vintage Burgundy 1966 Mustang GT convertible owned by Mark Wieszyk from Adelaide, South Australia. This was our featured Attitude Of The Week for the week starting July 24, 2011. It has it's original 289ci V8 engine and an automatic transmission. Mark tells us more, "I purchased this Mustang convertible GT in 2009. It was imported into Australia from North Carolina in 2006 by the person I purchased it from. The car has been restored to a very high level. It is an A code 4V motor with air conditioning, power steering, front disc brakes, power roof and rally pack. It is a beautiful car to drive and the color combination between the exterior and interior catches a lot of attention. The car won a sponsors award at the 2010 Australian Mustang Nationals in Adelaide and has been featured in Australian Mustang and Ford magazine." Raven Black 1966 Mustang GT hardtop owned by Daniel De Bono from Australia. This beauty is our featured Attitude Of The Week for the week starting November 18, 2012. Daniel tells us more, "This 1966 factory GT coupe just spent the last 36 years with it's previous owner in Greensboro, North Carolina. Frank (now 82 years old) was the second owner as he'd bought it from the original owner who ordered it as a customer order back in late November 1965. It was optioned out nicely with an A code engine, power steering, a banded windscreen, green glass, pony interior, Rally Pac, long console, rear speaker, and AM radio to complement all the GT extras. It arrived in Australia in January of this year with 68,336 original miles. It still has many original features including the trunk liner, spare white wall tire, jack and ratchet, all panels and interior are also original (except for the carpet and mats), All bolt on parts such as power steering pump, 4bbl carburetor, intake manifold and so on are original numbers matching as well. This beautiful example of American automotive design still has the buck tag attached and is accompanied by the original factory build sheet of which I found the last piece (Bottom left hand corner) stuck under the passengers seat just a few weeks ago." Wow. Check this one out. This is an Antique Bronze 1966 Mustang GT fastback. It is owned by Emmanual Theux from Monaco! It has a 289ci HiPo V8 engine and a manual transmission. Emmanuel has owned many Mustangs. Check them out by clicking here. Arcadian Blue 1966 Mustang GT fastback owned by Phillip Brown from Fort Smith, Arkansas. It has a 289ci V8 and an automatic transmission. Phillip tells us, "Factory GT Fastback 'A' code, Edelbrock 4 barrel, MSD billet distributor, 17-inch Cobra R wheels, Jensen AM/FM Cassette, and glove box signed by Carroll Shelby with certificate of authenticity. The paint and interior are in great shape with the exception of a couple of chips. It runs and drives great. This car has won several trophies. CASH ONLY! No scammers." Emberglo 1966 Mustang GT convertible with steel styled wheels, white GT side stripe, emberglo and parchment pony interior, fog lamps, and a 200hp (at 4400rpm), 289 cubic inch, 2 barrel, V8 engine. Springtime Yellow 1966 Mustang GT convertible with GT rocker panel side stripe; styled steel wheels; fog lamps; and a 225hp (at 4800rpm), 289 cubic inch, 4 barrel, V8 engine. Tahoe Turquoise 1966 Mustang GT fastback with steel styled wheels; white GT rocker panel stripes; hood scoop; fog lamps; Wimbledon White Shelby 10-inch wide over the top stripes; and a automatic, 289 cubic inch, 4-barrel V8 engine. Emberglo 1966 Mustang GT hardtop with steel styled wheels, rocker panel stripe, fog lamps, GT fender emblem, and a 289ci V8 engine. Blue 1966 Mustang GT fastback with steel styled wheels, white rocker panel stripes, fog lamps, and a 289ci V8 engine. We think this car is painted in 1965 Twilight Turquoise. Emberglo orange/brown/copper 1966 Mustang GT fastback with GT fog lamps, white GT rocker panel stripe, steel styled wheels, pony interior, and a 289ci 4-barrel V8 engine. Beautiful Emberglo orange 1966 Mustang GT hardtop with steel styled wheels, white GT rocker panel stripes, and fog lamps. This is how Emberglo looks best, in the sun! This Arcadian Blue 1966 Mustang GT convertible was our Attitude Of The Week for February 8th, 2009. This convertible has GT steel styled wheels, GT grille mounted fog lamps, GT rocker panel stripes, and an A-code 289ci 4-barrel V8 engine. This car has new paint but original interior. This is a 1966 Mustang GT white vinyl hardtop with special order Sapphire Blue exterior paint with blue pony interior and an A-code 289ci 4-barrel V8 engine. Sapphire blue was a standard color for the 1966 Shelby Mustang and 1966 Ford Thunderbird, but not the standard 1966 Mustang or Mustang GT. We have several examples of this special order color on other Mustangs. This car has been restored although it only has 20K miles on it. Candyapple Red 1966 Mustang convertible with GT front grille and fog lamps, aftermarket wheels, and a 289ci High-Output V8 engine. This car was at the 2010, Port Angeles, Washington, Mustang car show. This blue 1966 Mustang GT convertible was on display at the 29th Annual Central Illinois Ford Day Show and Swap on June 6, 2010 in Bloomington, Illinois. It has a blue interior and the 289ci High Performance V8 Engine. An Emberglo orange 1966 Mustang GT convertible at the 2010 MCA Grand Nationals car show in Bellevue, Washington. This one has steel styled wheels, GT rocker panel white stripe, GT fender emblem, fog lamps, and emberglo pony interior. Check out this Emberglo 1966 Mustang GT convertible! This car was ordered with everything - big K-code engine, full GT package, and Pony interior. This car was a highlight of the 29th Annual Central Illinois Ford Day Show and Swap on June 6, 2010 in Bloomington, Illinois. Candy Apple Red 1966 Mustang GT hardtop at the 2010 Mustang and Ford car show in East Peoria, Illinois. The paint on this car looked great. I like the white GT style rocker stripes. Magazine ad demonstrating the importance of the power front disc brakes on the 1966 Mustang GT. It is titled, "Ford comes up with a real stopper!" This Candy Apple Red 1966 Mustang hardtop was at the 2010 Mustang Roundup in Tampa, Florida. It has grille mounted fog lamps, wire wheel covers, parchment interior, and a 289ci 4V V8 engine.